Data volumes are growing exponentially, but your legacy NAS appliances can’t scale to accommodate the growth. New solutions that do claim to scale-out lock you into proprietary expensive hardware and fail to support global deduplication. Your digital business needs a better solution to handle unstructured data; one that continues your data center modernization journey, so your environment can efficiently handle any kind of workload--file share, backup, archive, analytics, and more. Cohesity delivers scale-out file storage for the cloud era in a modern, software-defined solution that eliminates the complexity and costly management of a fragmented and inefficient storage environment. Consolidate all file services workloads via multiprotocol access (NFS, SMB and S3) on a single platform that spans from core, to cloud and edge. Enjoy guaranteed data resiliency at scale with strict consistency and data efficiency with global variable block length deduplication and compression across different workloads. Don’t let traditional secondary storage complexity hold you back. Choose Cohesity to help you manage the onslaught of data coming into your enterprise. IDC forecasts that by 2025 the global datasphere will grow to 163ZB, or a trillion gigabytes. Be ready, be resilient with the Cohesity DataPlatform. Cohesity is a proven, truly distributed file storage solution for unstructured data that is optimized for small and large files and can easily expand with your business. Worry less with Cohesity, the only file system to guarantee data resiliency at scale with strict consistency. Maximize your storage capacity with Cohesity’s global variable block-length deduplication (between different workloads) and compression. Consolidate all of your file storage workloads on a single solution, then easily and transparently scale both compute and capacity with Cohesity’s building block nodes. Manage all your data through the protocol of your choice. Software-defined solution for easy adoption on a VM, as a Cohesity appliance, or on qualified HPE Proliant and Cisco UCS servers. Access the same data set with Cohesity’s multiprotocol support (NFSv3, SMB2.x, SMB 3.0, and S3) on a single platform. Rely on limitless and fully-hydrated SnapTree® snapshots for granular file system views, as well as writable snapshot clones, to instantly provision test/dev environments. Cohesity provides strict consistency at scale, guaranteeing users always see the most current data, and data is protected as soon as it’s written. Cohesity includes a snap in for the Microsoft management console, allowing Cohesity file shares to be managed by MMC. 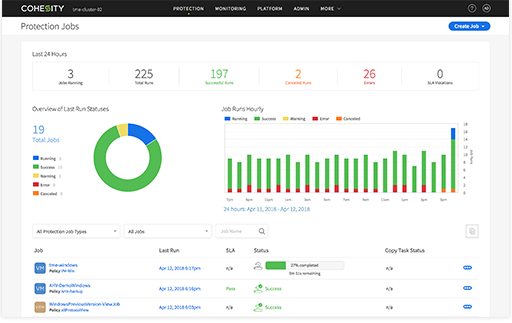 Directly access the ID mapping information stored in Centrify’s AD through native integration with Centrify, eliminating the need for an LDAP proxy and simplifying the user experience. Cohesity lets you scale-out seamlessly to address unstructured data growth. Expand easily with non-disruptive software and a pay-as-you-grow model, eliminating forklift upgrades and time-consuming hardware updates. True distributed file system that scales-out limitlessly to meet your growing unstructured data needs on-prem and in the cloud. Deploy in your data center, private cloud, edge, or in a leading public cloud such as Amazon Web Services, Microsoft Azure, or Google Cloud. Leverage on-premises benefits in the cloud with native protocol access. Learn more about Cohesity’s Cloud Integration. 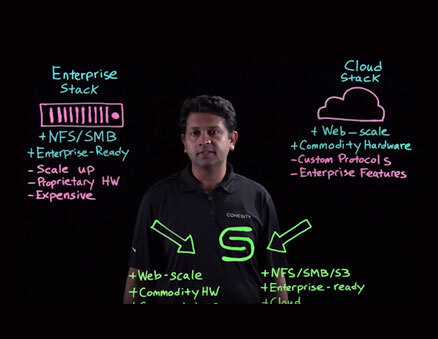 Eliminate bolt-on cloud gateways and simplify direct data access into the cloud. Archive into public cloud services for long-term retention. Utilize cloud tiering for transparent capacity expansion into the cloud, and replicate into the cloud for disaster recovery and test/dev. Create an elastic IT environment with Cohesity’s software-defined model, so you can instantly and easily address changing business requirements. Gain unparalleled storage efficiency with true global deduplication, even across nodes. Cohesity uniquely dedupes across clusters, workloads, and protocols. Global, inline variable-length block deduplication optimizes capacity efficiency and dramatically reduces your data center footprint. Accelerate application development by instantly provisioning zero-cost fully hydrated clones. Gain greater insight into your data with in-place analytics. Eliminate noisy neighbor problems. Built-in policies allow you to optimize performance for different types of workloads so you can use Cohesity simultaneously for target storage as well as analytics. Cohesity DataPlatform supports erasure coding (2:1, 4:2, 5:2) to reduce your data center footprint and ensure data is protected against any individual node or disk failure. File system metadata is indexed upon ingest, enabling Google-like search across all files in a cluster. Cohesity’s integrated software-defined data protection eliminates the reliance on traditional NDMP protocol. Significantly simplify data protection and file stores onto a single platform, while easily adding archive to Amazon Web Services, Microsoft Azure and Google Cloud. Simplify user and group access to data using credentials and permissions through Windows Active Directory and Kerberos integration with role-based access control (RBAC). Create and manage custom Cohesity cluster administration roles for domain users and groups. Cohesity’s integrated data protection software and SnapTree technology simplify file system data protection with fully-hydrated snapshots. Leverage data-at-rest, as well as data-in-flight encryption using the industry-standard 256-bit Advanced Encryption Standard (AES) algorithm. Cohesity is also FIPS 140-2 compliant. Long-term data retention with compliance controls, mandating a policy that files systems cannot be modified during the lock time is only possible with Cohesity. Easily establish user and file system quotas with audit logs. Good storage platform. Good backup & recovery. NAS solutions also very reliable and stable. Good tech support and platform relatively user-friendly. Looking for Cloud-Ready Scale-Out File Storage?